The Two Rivers Contest Club had earnest beginnings. Rich Strand KL7RA operated a world-class multi-multi contest station from the very same location for decades. This is the very same building from which he had many successes. N1TX and the gang at KL2R have worked since 2006 to make it a serious SO2R and multi-two station. We now have a full complement of antennas for 80-10 as well as SO2R and multi-two. Many of our contesters enjoy digital events, and you can hear N1TX and KL1JP pounding brass. The shack currently features Yaesu FT-950s with DMU-2000 as well as an FTdx5000MP, both with MicroKeyer II interfaces and Station Masters to control antenna and bandpass filter switching. An ACOM 1010 and an Alpha 89 are recent additions to cap off high power abilities. 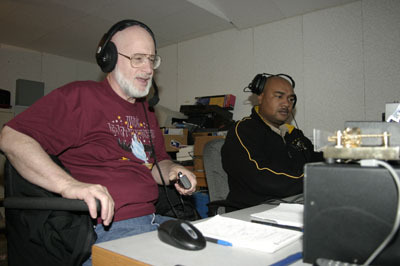 Turning on the way-back machine: Shelley Levine KL1SE (left) and Rod Mitchell KL1Y worked hard for contacts during CQWW SSB in 2006, taking Alaska M/S. Sadly, both have moved away. Our other successes are small but fun, too. 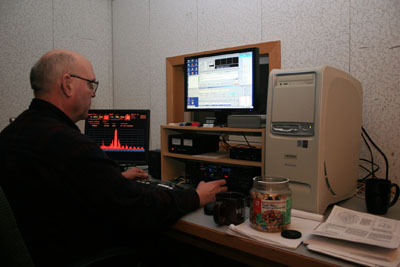 For example, KL1JP and N1TX won Field Day 2007 in Alaska using CW and digital modes only and 100 watts. Making contacts from the Far North is a more difficult situation than many may imagine, and our QSO counts so far have been tiny when compared to many larger scores outside the polar regions. Bands are capricious here. Shack improvements have been a high priority forever. Inside storage was minimized and operating space plus a workbench maximized. The mess ebbs back and forth. There's plenty to do inside at 40 below before additional antenna work begins in the spring. KL2R's primary reason for existence is to serve as a training ground and experimental station for those interested in contesting. Alaska provides some unique challenges to this hobby. Success depends on developing keen operating skills, many times even for "casual" contacts. The Two Rivers Contest Club offers a chance for members to learn these skills and to try new techniques and technologies in a casually competitive way. Founding member Dan Wietchy KL1JP has been a key motivator for and contributor to much of the work that gets done around the shack. Wayne Santos N1CKM (left) now operates from New England, but hopefully this contest "Manimal" will return soon for another Alaskan gig. We look forward to next summer when members Ken Farr W6HF and XYL Luci KL1WE return for another season. Elaine Meindl KL6C adds a lot of enthusiasm to some contests each year when she's not working or enjoying the great outdoors. Phil Sauvey KL8DX is a Field Day regular now. Gary Pearse NL7Y and Justin Burket KL1RL need to operate more! We are also looking for more locals to join the fun. Larry N1TX will tell you, "You had better be careful what you wish for. I can now see how KL7RA could become obsessed with building a contest station." He is usually at the key(s) or mic at some point during a contest. XYL Connie KL1BE is supportive, but she resists getting close to a microphone during a contest. "I just know her voice would be worth 15 multipliers an hour," N1TX waxes. Her tasty meals and hot coffee keep the team going throughout contest weekends. Larry got interested in contesting almost as soon as he was licensed as KA3HIY in 1981. WB3EPC introduced the idea, and mentor Jerry Bliss K6III helped the magic come alive when both were stationed in England during the mid-1980s. Back in New Hampshire, VHF and microwave contesting, Field Day, ARRL Sweepstakes, and ARRL DX were big events. Dale Clement AF1T provided a lot of equipment and expertise for N1TX to succeed as a rover during the VHF/UHF fun. 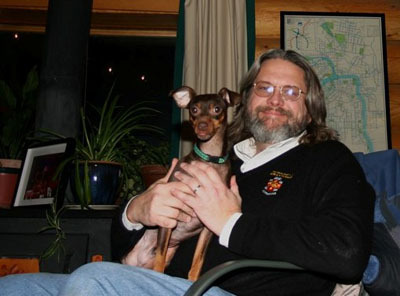 The club mascot, Louie, is a three-legged min-pin, and is a real DX hound. He has final say over who becomes a club member. Louie is still king but is fading into retirement at 17. Two others, Fannie and Bonnie, are his vocal understudies. 2017 additions include two retired sled dogs, Olaf and Elsa. Olaf is quickly becoming settled in the shack. At left, Gary NL7Y checks out the ergonomics of an early operating position configuration. Things have since evolved to be more comfortable and user-friendly. It's almost funny to look back at the modest beginning. After several years of running dual FT-950s, one of the transceivers has been replaced by a Yaesu FTdx5000MP, complete with Station Monitor. It is also running CloudIQ as an IF receiver with point-and-click tuning through SpectraVue. The FT-950 on position B has retained the DMU-2000, so both positions now feature bandscopes. For a while, we experimented with an RF Space IF-2000 board and 10 MHz IF output to a FiFi SDR as a bandscope and second receiver. Unfortunately, HDSDR used to drive the FiFi is just too much for the CPU when running Win-Test or N1MM on a 1.8 GHz CPU. Both operating PCs have been upgraded to fast i7 machines running Windows 10, which have no issues with demanding applications. The Force 12 C3 at 55 feet is fixed towards US and South America, ESE from Two Rivers. A vertical delta loop (Radio Works Super Loop 80) strung between the tower and trees is used on 80-30m. 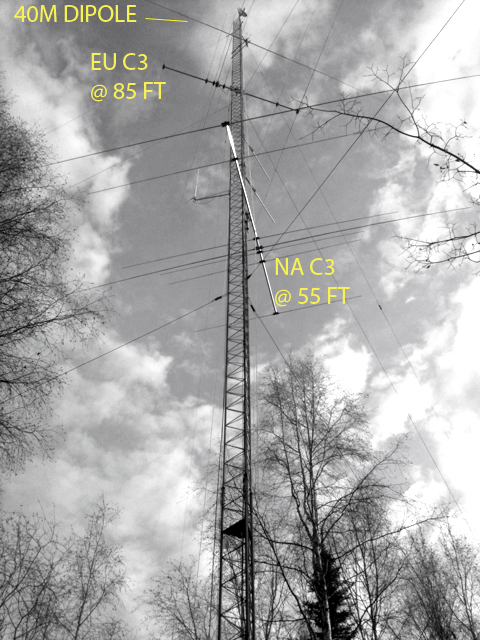 A second C3 has been installed at 85 feet and pointed towards Europe. A Force 12 EF-140 rotatable dipole for 40m adorns the 100-foot level directed E-W for NA and JA. In November 2014 we completed installation of a two-element 40m vertical array, which is now much preferred over the EF-140. The 60m band is intriguing, and a few JT65 contacts have been accomplished using the 40m verticals and a tuner. Top Band needs some work. Several years ago we added a Cushcraft MA-160V, but it still needs more radials. We're also considering a vertical (or perhaps a two-element array like the 40m system) or perhaps a 80m horizontal loop to augment the Super Loop 80. An 80m dipole runs vertically off the tower with the lower leg more or less horizonal to make it an "L". An Array Solutions SixPak 2x6 antenna switch mounted at the tower base feeds two positions, A and B. W3NQN bandpass filters and a Hamation AS-419 Bandpasser BPF unit allow simultaneous operations. Warning; N1TX learned the hard way W3NQN filters are only rated to 200W into a VSWR 2:1 and less. The EF-140 dipole (high VSWR) and FTdx5000MP (200 watts) proved that point. Burned capacitors. A replacement was in the mailbox within a couple of weeks. Lightning protection is provided at the tower through Polyphaser in-line protectors. Their mounting plate in a weatherproof box is grounded to a leg of Rohn 55 using one-inch tinned braid. Additional lightning protection is installed at the shack with copper grounding bars from Storm Copper with a single-entry tie point planned. The tower also contains a wireless ISP access point and backhaul equipment, a 6/2/70cm vertical for use with FT-8900 and FT-847 VHF radios, and two phased, five-element yagis for APRS transmissions. 2RIVRS serves as an iGate. 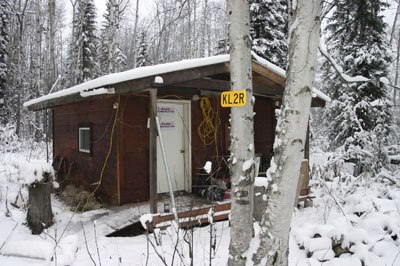 We have also been supporting KL7CDA's C4FM and WIRES-X projects.